Family Feedbag: WIN a KitchenAid Produce Preserver + grocery money! 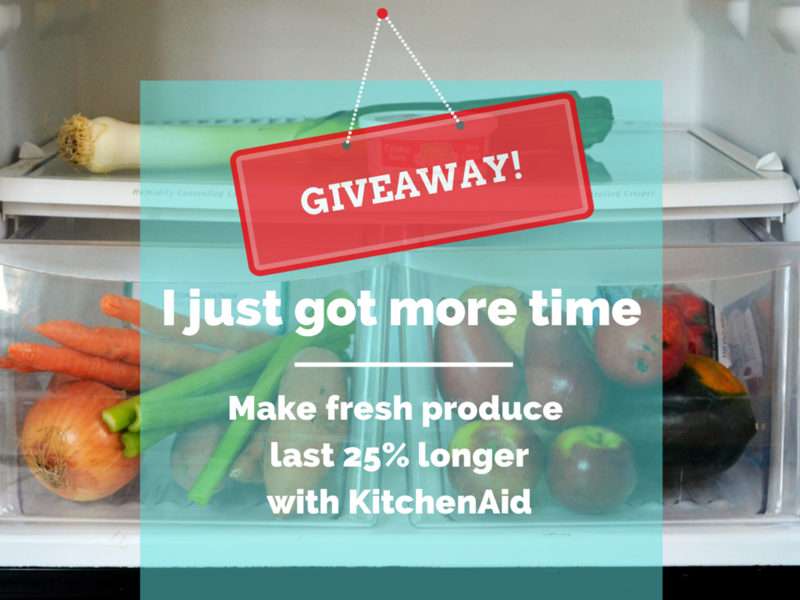 WIN a KitchenAid Produce Preserver + grocery money! 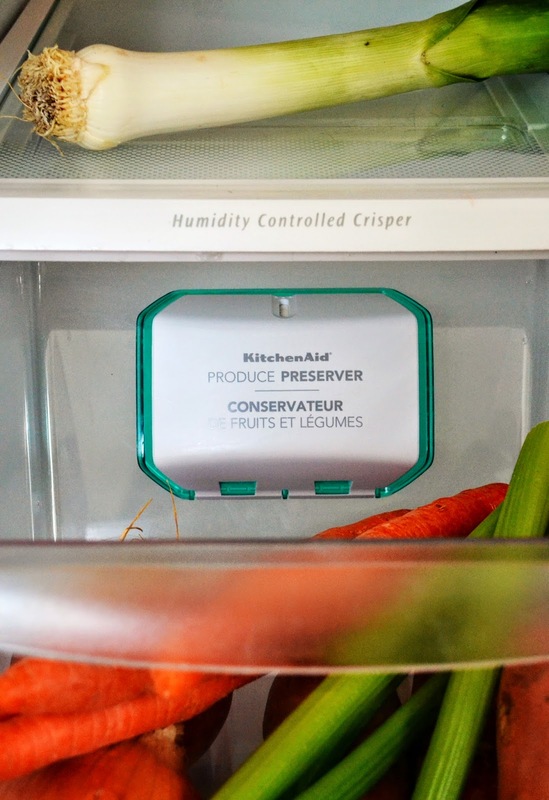 Disclosure: KitchenAid Canada sent me a Produce Preserver to try out in my fridge and a grocery gift card to stock my crisper with fresh ingredients. One reader will win their own KitchenAid Produce Preserver and $50 towards groceries. There are two things that make cooking for my family easier. The first is time. The second is having the fresh ingredients I need on hand. Without those two things, the job of putting together meals can start to feel less like a pleasure and more like a chore. With my new KitchenAid Produce Preserver, my fresh fruits and vegetables can last longer, giving me more time to get them into our meals. Buying fresh produce is always filled with good intentions. Putting carrots and celery into my shopping cart for soups and stews, or picking up pears and oranges for school lunches, naturally feels good. So it's an awful feeling when I don't quite get around to using those things at home and end up tossing them in the compost bin. It's defeating. It's costly. And it ends up in yet another trip to the grocery store with good intentions. My new Produce Preserver keeps me stocked up on fresh ingredients, saving me time and money. It attaches inside any refrigerator, absorbing ethylene gas that is naturally given off by fresh fruits and vegetables. The result is freshness that lasts up to 25% longer. That may not sound like a lot at first, but that could mean a whole extra week for me to use up those fruits and veggies. It really is a gift of time. About the size of a deck of cards, the Produce Preserver easily attaches to any flat surface using the provided suction cups. Mine is at the back of my crisper drawer. A starter kit retails at a reasonable $16.99. The Keep Fresh Packets last about 6 months (the indicator will tell you when it's time to refresh) and refill kits are inexpensive, retailing at about $12.99 each. Considering how much food can be thrown away in 6 months, it can be an affordable solution to food waste. To enter, leave a comment on this post telling me the last fruit or veggie you threw out because it went bad in the fridge. PLEASE LEAVE AN EMAIL ADDRESS SO I CAN REACH YOU IF YOU WIN. A winner will be randomly selected on Sunday, September 28th, 2014 at 9 p.m. Eastern/6 p.m. Pacific. Salad greens are a big one for me too. Can never seem to use them all up before they're done. Ack, throwing out strawberries! That one hurts every time. Salad greens and a bag of fresh limes. I was so disappointed when they went bad as I had some delicious plans for the limes. Good intentions. Every time. Sigh. Strangely, mine is also green onions. I just tossed a bunch in the compost, about 15 mins ago. So tasty, and yet I forget about 'em too. I have recently thrown out tomatoes and lettuce as they have spoiled in the fridge. I try not to buy more than I can use, but it sometimes happens anyway. I would love a KitchenAid Produce Preserver as I think it would really help me. If I win, you can e-mail me at j.funfer@gmail.com. Thank you! I usually end up making soup or anything goes egg scramble, to avoid throwing out veggies, but baby spinach is a tough one. I had to throw some out last week. I swear those spinach leaves at the bottom sometimes go bad before I'm even home from the grocery store. That darn lettuce! Thanks, Roxanne, and good luck. I'm sensing a theme here. Green onions and lettuce are trouble makers in the fridge. Good luck! Ew, those are so gross when they go soft. Thanks, Linda! I always end up throwing out tomatoes and lettuce - they go bad so quickly. Those bad vegetables. Good luck! Mmmm, furry zucchini. Good luck, Colleen! Celery!!! I can never seem to make it through a whole bunch. And greens...I have really good intentions when I buy them. Nothin' quite like limp celery. Good luck, Sandra! Oh, that's rough. You need one of these thingies! Good luck. Argh. Tough one. Bye bye, peppers! Good luck. Green onions and celery! This product sounds intriguing! Those green onions, I swear I mean well every time I buy them too. They're so good. Good luck. Oh, that's heartbreaking. If it makes you feel any better, I have a GIANT zucchini rotting in my garden and I can see it from my kitchen window. Every day. I feel shame. Good luck! It's enough to make you cry! There's always next year. Good luck in the giveaway! Brocoli was my most recent victim. :( I hope I win! I hope I win!! Oh no, not the green trees! Good luck. Where do i begin - lettuce, onion, tomoato, cucumber, grapes, apples, mango, blueberries and strawberries. So, a lot then. You really need this thing. Good luck! Raspberries and cucumber. Thanks for the chance to win! Raspberries. So lovely. So delicious. So moldy. So fast. Good luck! Oh that is a brilliant gadget! I just had to compost a whole bunch of peaches, so sad! I have heart palpitations over the fact that you had to toss PEACHES! The worst. Good luck. Salad greens and part of a cucumber. Thank you for the chance to win. You're welcome. Don't forget to leave your email address! A batch of asparagus that I really wanted to eat but forgot about! Darn it, that's a bummer. Good luck, Dana. I swear old celery must have been the inspiration for Gumby. Good luck, Maggie. Sadly, a $7 bundle of asparagus. I love that you even remember how much it cost. You're married to a taco night hero, you lucky woman! Good luck. Those zukes last a long time in the fridge. Long enough to get forgotten about. Good luck! Poor, neglected cabbage. Good luck, Clare! Mine was cucumbers. I just had so many of them, and they went bad. Those poor, bendy cucumbers have gone to the pickle jar in the sky. Good luck! Figs... Beautiful, local figs that were too far gone even for jam :-( Broke my heart! Tomatoes and cucumbers, I hated to but had to. I had to throw out a lovely bag of tiny Kirby cucumbers that sadly had gotten moldy before I'd had the chance to pickle them.This device looks and sounds great!